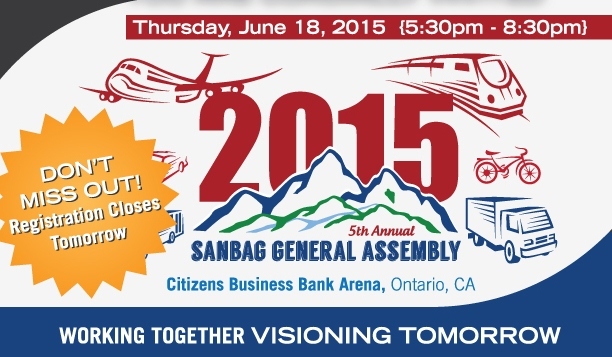 Time is running out to sign up to attend the annual San Bernardino Associated Governments General Assembly next Thursday, June 18, at Citizens Business Bank Arena in Ontario. Register today at http://bit.ly/SANBAG2015GA for this unique event celebrating SANBAG’s many accomplishments. This year’s keynote address will be given by retired Gen. Wesley K. Clark. SANBAG is the council of governments and transportation planning agency for San Bernardino County. SANBAG is responsible for cooperative regional planning and furthering an efficient multi-modal transportation system countywide. SANBAG serves all 2.1 million residents of San Bernardino County. As the County Transportation Commission, SANBAG supports freeway construction projects, regional and local road improvements, train and bus transportation, railroad crossings, call boxes, ridesharing, congestion management efforts and long-term planning studies. SANBAG administers Measure I, the half-cent transportation sales tax approved by county voters in 1989. The organization is unique among councils of governments and transportation commissions in California and is viewed by many as the model for integrated planning. Local governments within San Bernardino County find value in the monthly forum of city and county representatives who address issues of mutual concern with a unified voice.